Correction, it's a 20A breaker, with 30mA RCD. So what chance has a sizzling lil Weller trannie got to pop DJs breaker ? > PowerBall win chances ? it may heat up around the 8 to 12 amp range (depending on the breaker design/curve) and trip the power board. It was plugged into two power boards in series, each of which has it's own (presumably 10A as that's the total rating) breaker. Plus the main switch board 20A breaker. The power board breakers were not tripped. So absolutely no way it tripped the 20A mains breaker without tripping the others, it was most certainly the 30mA RCD that tripped. You were arguing that the transformer is unsafe. you cannot guarantee the safety of a transformer that was smoking it's enamel. Because the enamel melts and the turns short out, and this likely happens in a progressive accelerated fashion, effectively feeding on itself in a thermal runaway of sorts. Thank you. Likewise, and I do appreciate your sense of humour. Some are getting a bit defensive, and this guy wants me to die. Dave, dont worry. Darwinism will take good care of these people. Please pardon my ignorance, but how does that work? Can you not see the potential for primary to secondary isolation failure and unfused mains into the iron element ? If you look at the soldering station's PCB's grounding, it's um not so great. My experience is certifiers will pass full current 15A (in North America) through ground for an hour to ensure the safety ground would not fail. This checks things like via's, thermal reliefs, PCB traces etc. do not open-circuit. Now take a look at the Weller PCB... see if you can spot it. If the transformer was allowed to continue to burn up, the bobbin can melt inside and cause mains to bridge over to the secondary winding. The melting bobbin can also bridge primary to the core. It is all part of the transformer certification checks. Even if the potential could actually be quantified, there is protection after the secondary. I doubt that the wire would have the energy or time required to melt through the bobbin and contact the core, but even if it did, it's contained in the enclosure. If the MCB section had popped, there would have been a spark and the zapped plug/socket eminating a slight scent of...brimstone ? There could also have been significant leakage the earth already from the melting enamel and smoke etc, and didn't take take much else to trip it. RCD's can trip all the time based on all sorts of factors like inductive kickback from suddenly disconnected loads and other influences. I see. The transformer was highly energized, so the inductive kickback would have been beyond normal too. It likely arced to ground somewhere. Plus any other devices on the circuit. The one making the claim here is Weller. They have asserted by their own actions and lack of technical response to this issue that a fuse is not worthwhile in a couple of their low end products, but is presumably worthwhile in all their other products. Weller need to answer this, not the community. So far Weller seems to be right, as no real danger has been properly been quantified. I don't really understand how people can be so adamant about Weller being in the wrong without coming up with anything tangible. I can't see the PTC ever tripping, it's rated 14A and the quicker of the two other fuses will trip first. We all know a shorted transformer secondary winding here would result in a BBQ. During product certifications, one fault can (generally) be injected to the product, an open or short here or there as the safety standard dictates or the certifier chooses, to see if an unsafe condition results. The only reason I know of that would justify the triple-stupid string of fuses, is to thwart a short at "the output of the transformer" test defined as after the PTC+fuse, a technicality as they "belong" to the transformer assembly, they are part of the transformer. So short things after them. It seems to be a CYA for the lack of primary fusing. The transformer's external fuse has no part number, a Gerrman ELU/Siba item with only UL approval. Oddly it is varnish-dipped along with the transformer and PTC. Varnish can get into the fuse housing during the Vacuum Pressure Impregnation and corrupt its operation. Regulatory does not permit this- unless a fuse is declared air-tight, which is extremely rare. So this is a second Weller mess on this product. as well as sneak in a SUGGESTION to add in cheap fuses as CHEAP INSURANCE! before dwindling reputation and sales begin to go seriously south? 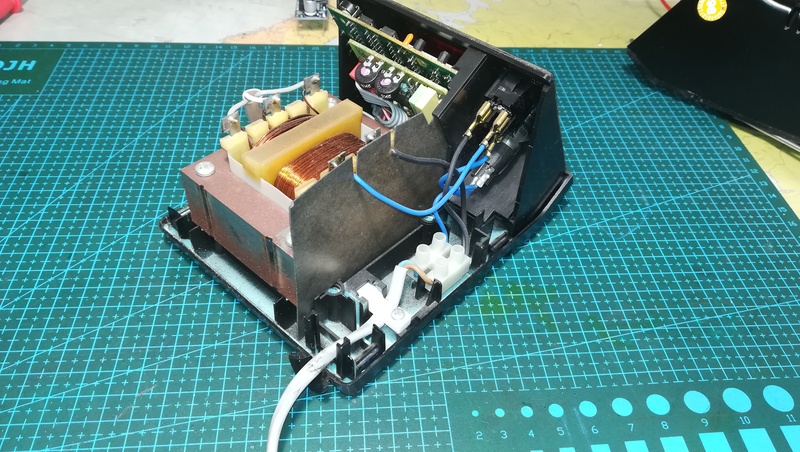 i wonder if you can put some kind of mechanical diode/integrator to work on thermal fuse expansion so that if it expands a few times times due to a thermal oscillation condition it breaks a switch. It always bugged me that its maybe possible for a damaged device to oscillate like that with a thermal fuse. Think of one of those dishwasher expansion thingies connected to a gear train. Thermal links do fatigue fail, they are a soft alloy and experience inrush currents. Unless you mean cycling a resettable one? A thermal fuse here would be rated below the magnet wire polyurethane and bobbin plastic limit of around 125°C. 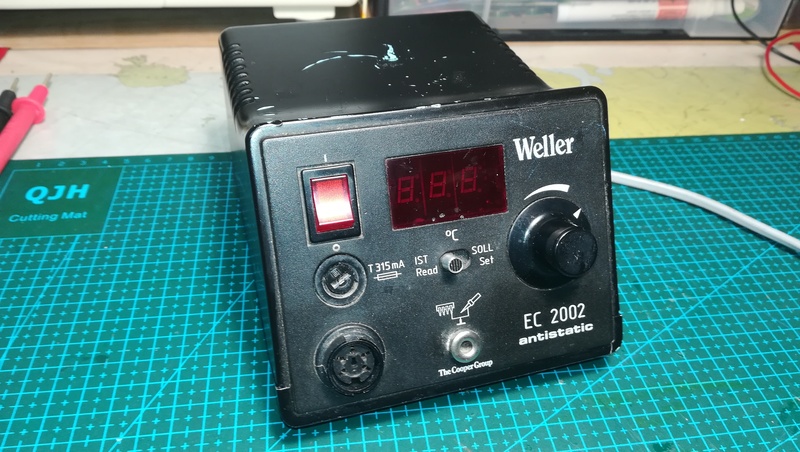 Here are some photos from inside one of my Weller WTCP soldering stations. As the schematic above shows there is no fuse in the primary of the transformer. The transformer is also constructed in a manner I have not seen before with the majority of the wingdings exposed. You don't have permission to access /eevblog/WTCP_TC202-1.JPG on this server. Images load fine on W10 and a Chrome browser. 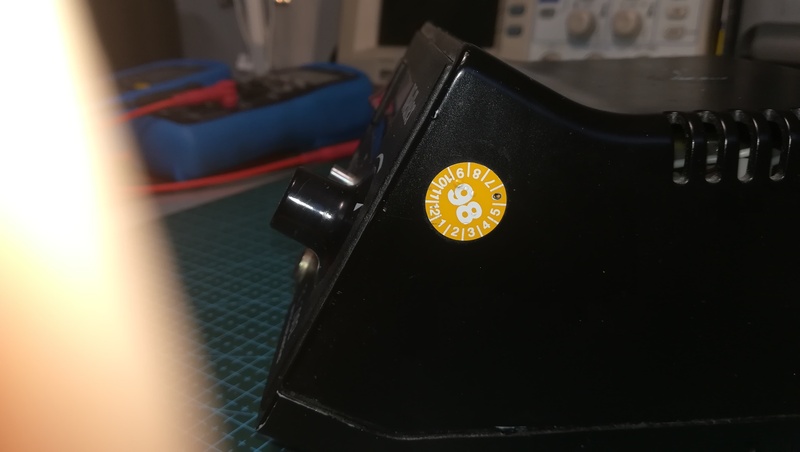 Is that an used soldering station or have you bought it brand new? I got it used 35 years ago. It spent 30 years approximately 200 yards from the Pacific Ocean. I have two of them and they still both work well. Here are some photos from inside one of my Weller WTCP soldering stations. As the schematic above shows there is no fuse in the primary of the transformer. The transformer is also constructed in a manner I have not seen before with the majority of the windings exposed. That is an antique station. No primary fuse (North America) was from a day of older electrical safety standards. UL 336B is long gone. My guess the primary-side fuse showed up around 1990 in Weller stations. 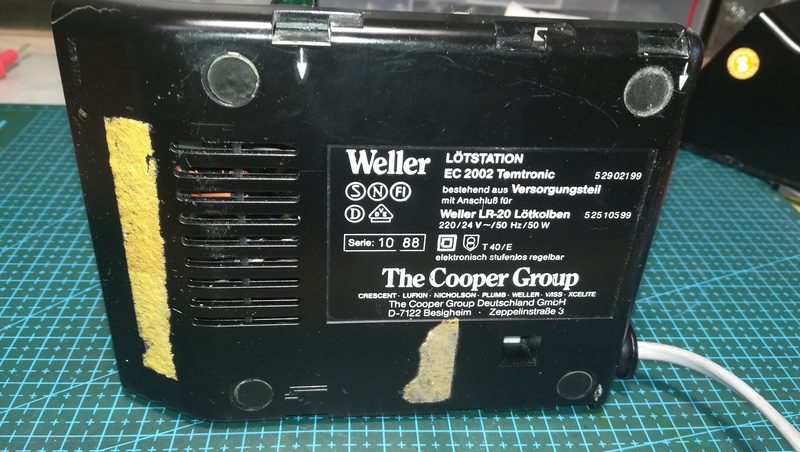 Inside is one of the solenoid-style power transformers used by Weller in their soldering guns and older stations. It has a ton of leakage flux, they used to make CRT monitors/TV's wiggle in the shop and add hum to any nearby breadboarding.